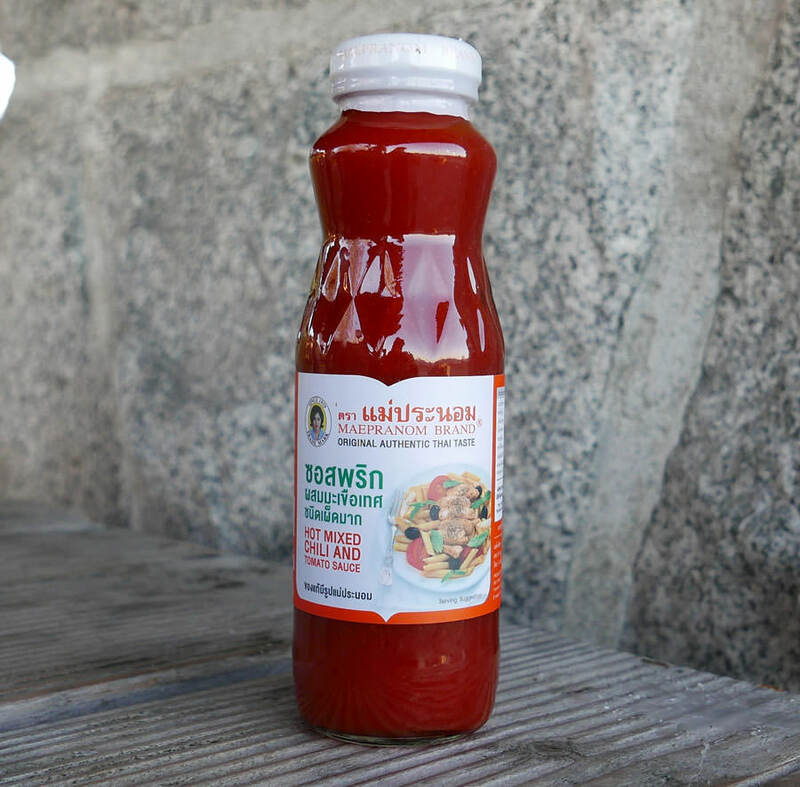 In this day and age of fancy ketchups, nothing can match the perfect balance of sweet and hot like this Thai ketchup, in Mae Pranom brand. Typically from Mae Pranom you get the very best taste, using fresh ingredients. This Thai Ketchup does not disappoint. The consistency is very similar to an American-style ketchup, and you get a nice sharp Thai chile heat. Many street vendor chefs in Thailand use Thai Ketchup also, you might be surprised. Some recommended recipes that use Thai Ketchup are shown below. Also see Thai ketchup used in Thai fried rice: Thai street vendor video. It's often added to fried rice. Our Thai customers will enjoy this typically with fried eggs (omelet) or fried rice, or pizza. It's also an excellent condiment for french fries, hot dogs, fried chicken, or anything else! Packed in a beautiful thick glass bottle. Ingredients: tomato, red hot chile, vinegar, sugar, garlic, red chile, salt, stabilizer (xanthan gum). No preservatives. Product of Thailand. Our customer Duncan in Overland Park KS sent us this via email: "The Maxchup Thai ketchup is very good. It knocks the french right out of fries. A real winner."